When I see the awesome work my design gnomes have put into Claustrophobia I get really excited. I just wish I could share it all with you now! Unfortunately, I do have to save some surprises for the actual book. Props to my talented brother, Donovan Sloan, for this provocative work. Lunatic Labyrinth is a Best Copper Seller on DriveThruRPG! To celebrate, we’re offering a big discount on the PDF until Friday the 25th. -‘Red’ Rumbholdt, dwarven explorer, describing the labyrinth below Stone Spire. Lunatic Labyrinth, a neat little one-on-one or solo adventure for the Pathfinder Roleplaying Game is now available on Paizo.com. The PDF is only $3.13 and includes a re-usable maze tile set. While the adventure is set in Avernos, you can easily include the adventure in just about any fantasy setting with minimal effort. If I haven’t said it before then it’s high time I did: check out Solo Nexus. It’s a blog all about solo gaming and solo role-playing. Even if you never play by yourself solo nexus has some interesting stuff and is well written. Recently my own Lunatic Labyrinth got a shout out, check it out. Win A Trip To The Dungeon – Well Done! Well done to all the winners of my “Win A Trip To The Dungeon” competition. You all win a copy of Lunatic Labyrinth from Drive Thru RPG. If you didn’t get your free copy, remember that Claustrophobia! is still in play testing and you can get a free copy of that and the super improved version by giving me feedback here. 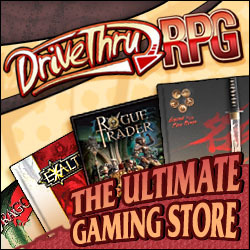 So today is the final day to enter the contest and get a free copy of my little adventure from Drive Thru RPG. Simply sign up for email updates on the right hand side of the page and I’ll send you your free copy, easy as that!